As an extra bonus for today's update, here is the first picture of the entire Noosehead band that I have ever posted online. Just click the image to see the full sized version! There are thirteen members in the band, including the piece of looseleaf paper, and they all perform very important musical functions. For example, that guy in the back sitting on the speaker is creating mic feedback. I have been getting a lot of emails lately asking where I got the PHP coding used to power the Sam and Fuzzy archive. Well, like basically everything on this website, the archive was programed by my good buddy Ashton, who has since made his Kamikaze Comic Manager script available to download for free on his website. Be sure to thank him if you use it! What's worse than having four weeks worth of your favourite television show pre-empted? Having it pre-empted by American Idol! So help me, when I turn my TV to Fox next Tuesday at 9 PM, I had better see Jack Bauer bursting onto the Idol stage with a hacksaw, or at least a head in a bowling bag. For whatever reason, Sam and Fuzzy has been getting way more unique visitors than normal for the last week or two. Where are you people all coming from? Email me and let me know! I have returned from my snowboarding adventure with my friends Ashton and Chris. Thanks to Alteka for updating the site for me in my absence. 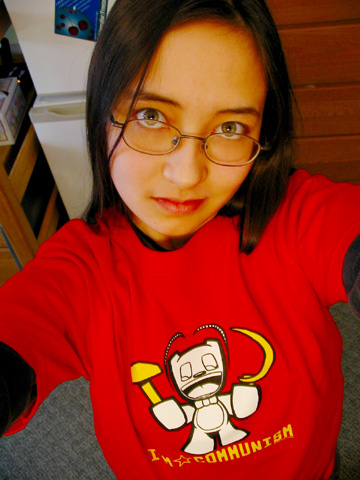 People are starting to get their I'm Communism shirts in the mail! I haven't gotten mine yet, but some folks have been nice enough to send me some photos. This one comes from Fallen's Aido.